I'm planning my first road trip with a friend. We're going from UK through France, probably Germany or maybe Belgium to Denmark and over to Sweden, back down to central France and then back home. We'll be over the channel for 5 weeks all in all. I have a gas camp cooker. We'll be travelling from mid-June until mid-July. Not interested in meat really (it'll be hot and my travelling companion is veggie). It would be great if you have any tips on good food items to buy and cook with on the road/ recipes that are cheap and easily doable or local goods that are tasty and cheap or any items that you can get in these countries that are great for road trips. It also has the advantages of not taking up much space. They do do a lot of veggie options too. Another option I can think of is eggs, Take plenty of eggs and you can generally make lot's of types of omelettes and spanish omlettes are particuarly tasty. Provided you get eggs from a supplier where the chickens are vacinated against salmonella (such as the Lion mark in the UK) you can keep them unrefrigerated for quite some time. In the UK, find a chip shop. Every town or village will have one. A bag of chips will cost you about £1 and will easily feed one person (sometimes two). There is nothing more British than chips. 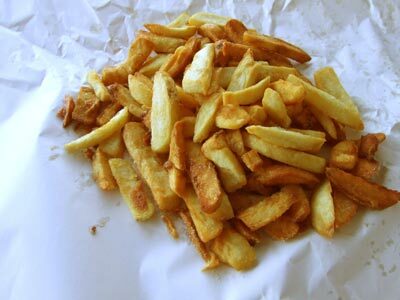 Personally I like them swimming in malt vinegar, if the fist chip doesn't make you cough then you've not put enough vinegar on them!! Presuming you're planning on eating at/near your vehicle you're not really limited by the weight or bulk of the food. So, anything you can easily cook in 1 or 2 pots is a good bet. Generally, I have some version of pasta/rice/couscous and sauce. You can make your own sauce if you can get fresh ingredients or get reasonably cheap jars or dried packets. I like adding some chorizo or similar spiced sausage to my sauces, particularly various red sauces. It keeps well and you can add it separately if people are vegetarian. Most places in Europe, definitely Germany and Italy, have there own varieties. They are also quite good for snacking, although some varieties may need cooking. For breakfast, fried breakfasts are always good. Otherwise, if you can get fresh milk cereal is an option or bring powdered milk. I also like porridge, although it is a pain to clean. For porridge, I'd recommend a mix of half porridge oats and half ready brek/instant porridge, with powder milk that can be prepared in advance. What are the proper precautions/protocols for storing food while car camping in an area with bears? How can I test out my equipment before a backpacking trip? Is 8 miles of unpaved gravel road a lot for a old-ish consumer road car to take in normal weather? Are there any techniques to cooking food when camping in the wild by harnessing the energy of the sun? How far from a road do I need to be to not hear the traffic? Road trip through the great American West - Anyone have Ideas for locations, areas, or activities?